I’ve read maybe a half dozen of Wharton’s novels and novellas and generally enjoy them – especially those with the pointed criticism of “society” in her era and the Gilded Age. 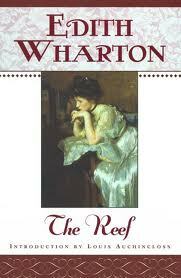 The Reef was one of her earlier works, published just after the depressing Ethan Frome. I think her later works are much better, but they’re not happy books either. The first 30 or so pages of The Reef were so completely boring with unnecessarily difficult language I almost quit, but when I got to Anna’s section, Book 2, page 36, I caught a very satisfying interest – and it seemed the reading was easier as well. Still, it took much longer than I expected a 165 page book to take, the end seemed to drag on and on, but Wharton, like her contemporaries, liked to make sure all the ends were tied. George Darrow, an American diplomat living in London, is waiting to hear from his former lover, Anna Leath, who is recently widowed. She puts him off even while he is en route to see her. During a waiting time in Paris he meets and helps the young, poor, inexperienced and also American Sophy Viner. She wants to become an actress and they become romantically involved. Letters to Anne don’t get mailed, a reply is burned up, etc, and they procrastinate leaving each other. The narrative slides over to Anna Leath, waiting for Darrow at her chateau and chatting with her young adult stepson, Owen, who saw Darrow with Sophy at the theater in Paris. Anna’s own daughter Effie is quite young, about 12, maybe? Darrow arrives and he and Anna are still very much in love and decide to marry. Then Effie gets a new governess. It’s Sophy. Darrow and Sophy haven’t seen each other for five months. Darrow tells Anne they met briefly when Sophy worked for a friend. Sopha is scared to death of losing her new position. The truth is, Darrow considers Sophy inappropriate to the position of Effie’s governess due to her behavior with him. Yet he feels responsible for her due to his behavior with her. This is the original substance of his dilemma – when he finds out that Sophy is engaged to Owen the plot thickens. At the heart and soul of all this is the various degrees of snobbery to be found in the Americans in France. Only Owen is not so encumbered but he’s in love, and possibly Sophy, and she wants to improve her station. Givré means “frosty,” for what it’s worth and the characters are frequently called by their full names – Miss Viner, Mr Darrow, and of course, Madame de Chantelle. Owen and Effie Leath are called by their first names, I’m thinking it’s to emphasize their youth. Anna is also usually called Anna instead of Mrs Leath. The whole thing feels the influence of Henry James with a lot of thinking going on to establish solid, realistic characters as well as the “Americans in Europe” theme. There is a very formal feel to everything from manners to language. The writing is overdone for our age and I had to use the dictionary more than a couple times. The punctuation is heavy but not as cumbersome as Dickens, just precise with lots of colons, semi-colons and commas with specific thoughts in quotations. Interesting to note also how much time Wharton spends describing the landscaping and interior of the chateau; her first book, “The Decoration of Houses” (1897), is a classic in the field. Also, fwiw, The Reef was first published in 1912, while Wharton was having such troubles with her husband whom she divorced the following year. She probably wrote it while in Europe, possibly France, where she lived most of the time after 1911. Teddy Wharton was involved in serial adultery among other irregular activities and I suspect his attitude may not have been too different from Gordon Darrow in the novel while it would seem Edith might know the part of Anna all too well. I would not go so far as to call the story autobiographical.